Located in southwest Colorado, Pagosa Springs is most famous for its natural hot springs. Surrounded by the San Juan Mountains, there is abundant access for exploring different areas of the national forest. During the summer, rafting down the San Juan River is an exciting adventure that is very popular. In today’s post, we would like to share some of the ways that you can experience fall in Pagosa Springs. If you enjoy your time so much that you would like to call this place home, make sure to contact Galles Properties and learn how we can help you acquire your own piece of Pagosa Springs Real Estate. There are so many live performances each weekend in the fall, that you may have a hard time choosing just one. Depending on the venue, you can expect to enjoy local food, cocktails, live music, painting parties, unique food trucks, and more. From square dances to bingo, to guided painting, you are sure to find a venue that will fully engage all of your senses. If you have always wanted to attempt painting, but were scared to try, then you should sign up for the abstract art workshop. This workshop that focuses on the basics is open to all levels of painting abilities, and if you’ve never even picked up a brush, you will find yourself in great company! This workshop allows you the opportunity to learn some different abstract techniques, as well as play with some different textures. Explore the colors and moods of fall in an environment that caters to brand-new artists. Seats are limited, so make sure to sign up and reserve your spot! Carnivals are fun for all ages as they bring out the inner child in each of us. Experience the Halloween carnival in Pagosa Springs and enjoy a wide variety of family-friendly activities. You can expect to enjoy activities such as obstacle courses, face painting, and traditional carnival-type games. If you are looking to be even more involved in the community, there are opportunities for volunteering at this fun event. Skiing may not be the first thing that comes to your mind when you ponder different activities to participate in during the fall. When you are in Pagosa Springs, however, you should make sure to take some time and enjoy the opening of the ski season on November 2nd at the Wolf Creek Ski Lodge. Keep in mind that the opening date is dependent on the weather, and therefore is subject to change. 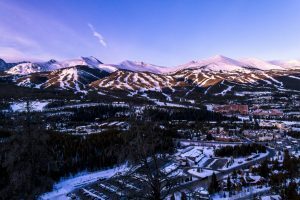 Whether you love to shred the slopes, or prefer to relax in the lodge, you will be sure to enjoy the stunning mountain views at this local resort. With construction finished this summer on its tenth lift, Wolf Creek is eagerly awaiting the beginning of ski season and offering you all the lines you want. Located about an hour away from Pagosa Springs is the city of Durango. Each year, they have a hot air balloon festival called the Colorfest Balloon Rally. On Saturday and Sunday morning, the weekend of the event, numerous balloons ascend into the air at the same time. With their wine and food festival on Friday, and the Music and Microbrew Festival on Saturday, you are sure to have an enjoyable weekend packed full of activities. 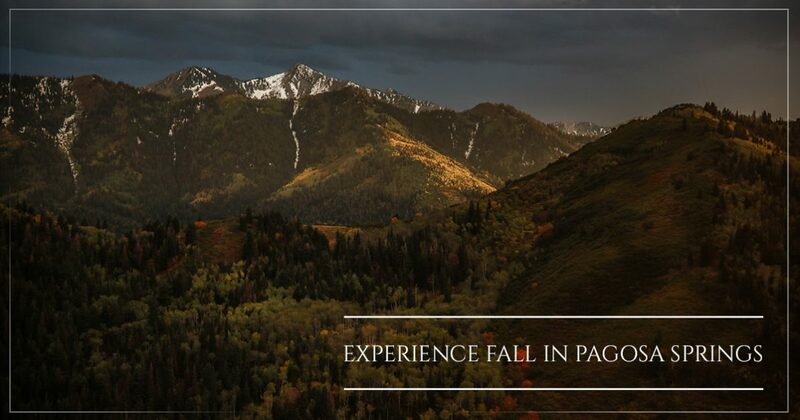 Experiencing fall in the mountains of Colorado is a visually stunning experience. When you visit Pagosa Springs, your other senses will be equally engaged with all of the fun activities available to you as the fall season is celebrated. If you would like to learn how you can call Pagosa Springs your home, or second home, then make sure to contact Galles Properties and learn how we can help you with Pagosa Springs real estate.